Every cent counts when you run a non-profit. Learn how to build an online charitable donation form with zero fees. Have you looked into donation forms and found the options quite limited? Processing fees may seem small to a business, but that 3-5% you lose in fees could do a lot for your organization. This is where most non-profits hit a roadblock. So few payment processors offer a donation service without fees. The ones that do have very limited integrations. Many non-profit websites rely on Paypal donate buttons. Paypal donate buttons aren't new, but they are very basic and very limited. Could your organization benefit from including Paypal donation options in your online forms? I'll use the Paypal Forms and MailChimp Forms plugins in this tutorial. But before you decide on the payment platform, read a case study about converting from PayPal to Stripe as a non-profit. Where should you put your charitable donation form? In past posts I've mentioned how powerful it can be to include an additional action in an existing form. If your newsletter signup is included in your contact form, conversions are usually much higher than a standalone signup form. The same is true with donations! It can be much more effective to include an "I would like to make a donation" checkbox in your contact form rather than a donation button all on its own. It may seem a little cynical talking about "maximizing conversions" in relation to a charitable organization. But remember, you're doing good work. You could do more good work if you had more funding. So you should never be shy about making the most of your donations potential. ** NOTE ** Paypal no longer allows recurring donations, which I personally find very disappointing. In a future blog post I'll discuss options for subscription payments and which has the lowest fees. For now I'll concentrate on getting the most from one-time donations. Regular subscriptions every month can be invaluable. But it's much easier to get conversions from a one-time donation form, when compared to signup for ongoing payments. Because of this, many organizations display the one-time donation form on their website. When a donation is made, the visitor is subscribed to a mailing list. Then options to support the organization with a monthly subscription is highlighted in regular newsletters. MailChimp is perfect for this purpose. Highlight the ongoing achievements and successes of your organization in a regular newsletter to make return donations and subscriptions more forthcoming. Step 1 - Add a checkbox to your form with a label like "I would like to make a one-time donation." Step 2 - Create a dropdown labeled "Donation amount". Include options for popular donation amounts. 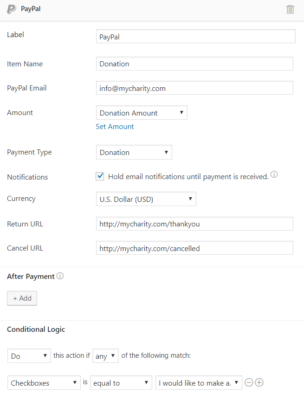 Step 3 - Use smart forms with conditional logic to hide your donation amount dropdown, until after the checkbox is ticked. Step 4 - Setup a PayPal form action. Make sure the payment type is set to "Donation". Select your donation amount dropdown field in the "Amount" setting. Don't forget to set the success and cancellation URLs. Use these pages to say thank you or give a visitor the opportunity to give feedback on why they canceled. Step 5 - Setup a MailChimp form action. This should add the user to your mailing list for supporters. I recommend the double opt-in method with conditional logic, so it only runs when a donation is made. Step 6 - Setup a "Thank You" email. This step is SUPER IMPORTANT!!! Are you truly grateful for the support? Let generous donors know how much it means to you. They may tell their friends, and they will be more likely to donate again in the future. Express your genuine gratitude, and let them know just how much it means! Set this email up in MailChimp or as an autoresponder in your email form settings. So that's it. Add a donation option to existing WordPress forms in six simple steps! 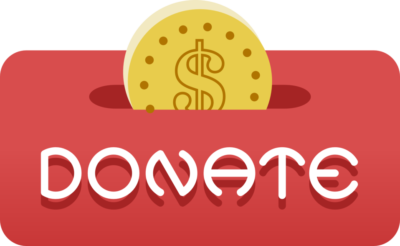 Want your charitable donation form built for you? Check out our PayPal donation form template where we've done all the work for you. Formidable Forms can also build standalone donation forms and recurring payment authorization forms. We'll look at these options in more detail in future tutorials. Is there a way to ask the donor if they want to cover the cost of the processing fee? Usually around 2.9% + $.30 per transaction. Many charity sites have that. If you choose the "Donation" option, there are no processing fees. Technically its against PayPal's terms and conditions to add a processing fee, so its definitely not something I would recommend - although I do see loads of websites that do this.